If you’re looking for a well-appointed home, then these luxury homes for sale in Durham won’t disappoint. Durham has grown in more ways than one since the Triangle region began to boom. The area boasts a leading university, endless amounts of culture, premier sports teams, thousands of jobs, beautiful countryside, and so much more. Now, Durham features a great selection of upscale communities, offering streets adorned with quality touches and lined with quintessential luxury houses. From boutique condos to sprawling executive estates, and multi-million dollar mansions, it’s easy to find the perfect residence to compliment your discerning lifestyle. Search through all of the current listings below, or keep reading to learn more about Durham’s luxury real estate market. Listing Office: Marie Austin Realty Co.
Something that you’re sure to notice when perusing the listings of Durham’s luxury real estate market is the abundance of exquisite homes that showcase classical features with a modern touch. Typically, upscale homes in Durham will boast a Mediterranean style with Spanish nuances, or are completely custom homes that have pulled inspiration from Traditional architecture and are graced with modern conveniences. Inside these well-appointed abodes you’ll find a wealth of exceptional elements like multi-car garages, massive chef’s kitchens, sophisticated lighting, dramatic fireplaces, private studies, sprawling backyards, fitness rooms, games rooms, and so much more. One of the hottest additions to Durham’s luxury real estate market in recent years is the construction of a new, boutique high-rise that’s located right in the heart of the downtown. These hot new residences will feature great open-concept floorplans, with floor-to-ceiling windows offering terrific views of the downtown and endless quality amenities. The building will include a fitness center, leisure pool, patio and lounge, and even a dog park. 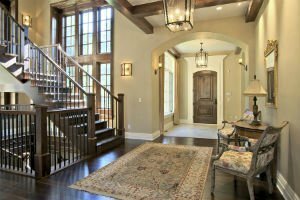 If you're thinking about a luxury home in Durham, you'll want a professional and experienced real estate team on your side to help you throught he process. Contact the My NC Homes team online or give them a call at 919-659-5173 for more information today.